After more than a decade this blog moved. It was not an easy decision. Yet time have changed. You can find me now here: www.myyogablog.net. This September challenge by Carmen on Instagram is indeed a challenge. First challenge is the asana. One must also find a location and one must take the picture. It's great if one is able to do the asana, yet it's better to practice an easier version than to injure oneself if the asana is beyond one's capacity. To respect the own limits is demanding, too. On picture #1 one can see who I fought with this asana. Today I repeated it but wrapped my arm only around one leg. It's still challenging, but safe. No strap was needed. That's the starting point from now on. If this feels good I can go deeper. 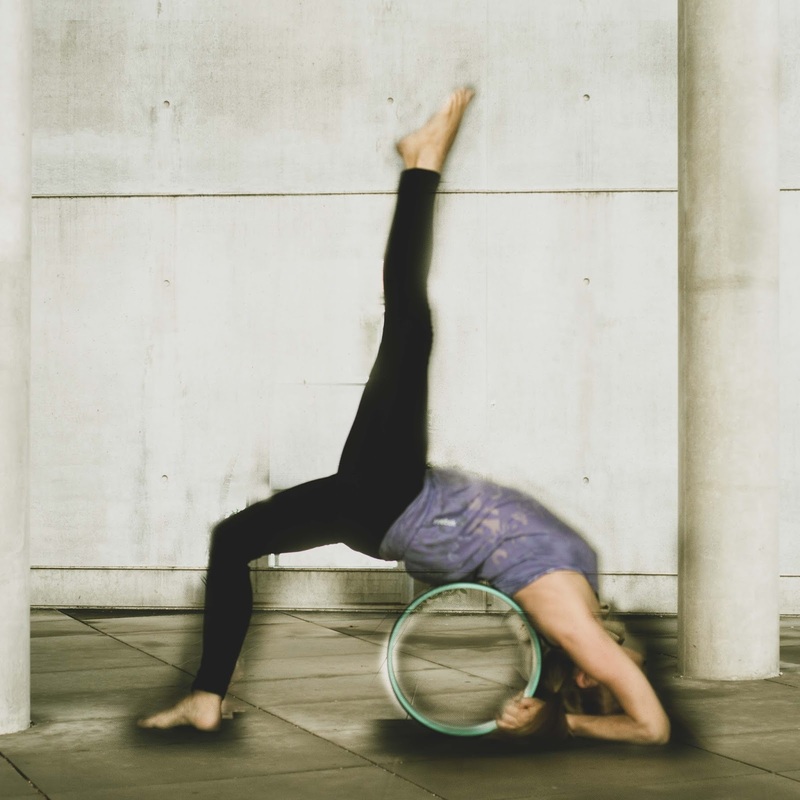 Today's pose (picture #2) was only possible with a prop, my wheel. The challenge is about exploring the limits. I feel them almost every day. Some of the asanas I'll integrate in my daily practice. It must feel good to perform an asana. First lesson learned: Take care. This challenge is about exploring the limits and not performing a perfect asana. There are 20 leg behind head poses in Ashtanga yoga. The first series has one: supta kurmasana. The second series has already 4 leg behind head poses. It becomes rather advanced in the forth series. To move into a tripod headstand with the leg behind the head is confusing. I tried it lately. That was it, I guess for a very long time. I learned supta kurmasana when I practiced second series already. 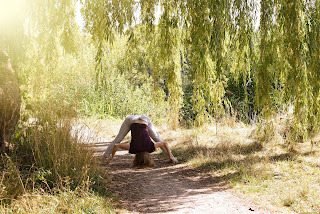 It's so much easier to learn first eka pada sirsasana (one leg behind the head) from the second series. Suddenly I was able to do supta kurmasana after having learned to take one leg behind my head. It became even comfortable with time. These days I work on that lightness again. I struggle with that asanas. I know now how it feels when it feels good to be in such a pose. All the 20 asanas have some craziness. I'm looking forward to learning them. All. No matter if one stretches parts of the back of the body or the front body or the sides in order to see progress one must be patient. To force the body into asanas might lead to injuries. On the other hand one must also feel the stretch. It's sort of discomfort. Even breathing and trusting fades away the discomfort. One might be able to get a tiny bit deeper in a pose. One must learn to be content about every inch deeper. This can be frustrating sometimes, especially if one is an impatient person. Success doesn't come overnight in yoga. There are asanas like headstand that can be learned within a few minutes if explained correctly. Yet stretching follows different laws. The older one is the longer it lasts to see progress. Hard work and time must flow into the practice. Somehow it helps if one is in love with the process. It's possible to learn how to learn if we face difficulties. How can one overcome the obstacles? Discipline remains a key word. Show up, do the work as best as you can. This picture was taken in 2009. I practiced in the heat of Mumbai. It took me a decade to take the chin to the floor. There must be faster ways, I always think and I know they exist. One can work smarter. One way is to add more repetition. To hold the poses longer is also crucial. Nevertheless stretching takes time. Being disciplined and being patience are essential skills. 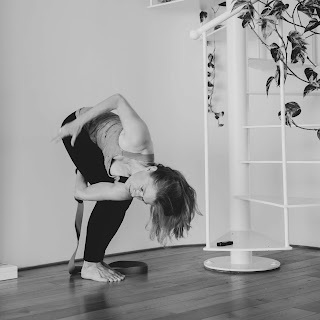 The summer heat makes it so much easier to get into poses that require flexibility. I sweat when I practice. At 6 pm I was on the mat yesterday. This is so late. Most duties were done, so my mind was free from stress of a long to-do-list. I was able to focus on the practice. I get stronger again. It's a joy to realize this. Every practice makes the next one easier. I'm happy with my home practice as I can adjust the practice to my needs. I distinguish between a performance and a practice that is focused on learning. Time to work on my to-do-list. Also today it's long. Yoga comes later again. It's OK to be that flexible. Rules are just an orientation. I'll start late again. I guess it will be 6 pm when I step on the mat. What counts is that I practice. To be alone at home has other challenges than going to a yoga class. My practices are satisfying. I realize that I get stronger and flexible with every practice. This motivates a lot. To practice when it's got is wonderful. The body is so much more flexible than in winter time. I'm happy that I can practice. With all this back pain issues I was not sure if I could go on. But I kept practicing, not often, but I never stopped totally. Now it's time to get back to a more challenging practice. To avoid back pain is the #1 rule. I even managed it to practice 'on the road'. Yet best is to be at home with all my props and all the time I need. 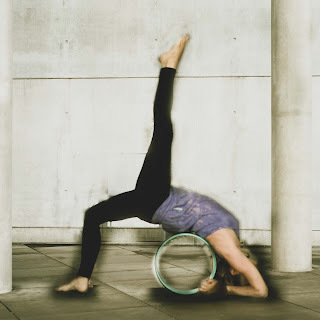 This blog is about my daily Ashtanga practice, what's going on in the Ashtanga yoga community and this and that about my private life. Be entertained. Back pain - what to do? It's also possible to practice at night. Why not. It's done and I feel excellent. Every practice counts. Time to sleep. I am on facebook, too. Join. All Rights Reserved. Any graphic or written material in this blog may not be published or used in any way without direct permission from the author.